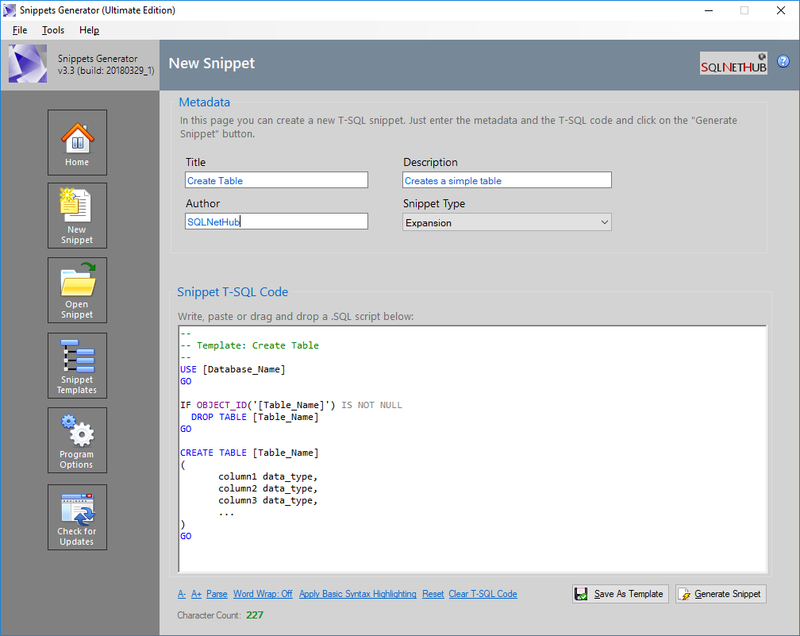 Snippets Generator is a tool that enables database developers to generate T-SQL snippets for SQL Server 2012 or later. It supports templates and carries out tasks very fast. By writing the T-SQL script from scratch. By pasting the script from the clipboard. By dragging and dropping a text or sql file onto the T-SQL text box. By using an existing T-SQL snippet template from Snippet Templates Library and complete the script based on the template. By modifying an existing script. Create a new folder and save the generated snippet file(s) there. In SSMS, click on “Tools” and then select “Code Snippet Manager”. Click on the “Add” button and select to add the folder you earlier created and which contains the generated snippet file(s). That’s it! You can now start using your own T-SQL code snippets! You can modify snippets by navigating to File –> Open Snippet. When you open a snippet, its data is automatically retrieved and imported into the relevant fields. Then you can modify the snippet and re-generate it. Title: The title of your snippet as it will appear in SSMS snippet manager. Description: A short description of what your snippet does. Author: Name of the person who authored the snippet. Snippet Type: The type of the snippet. Expansion: A new block of T-SQL statements. SurroundsWith: A T-SQL statement which surrounds other statements i.e. Begin..End. 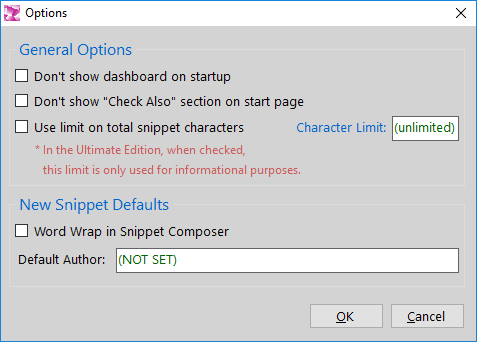 – T-SQL Script: The snippet code. 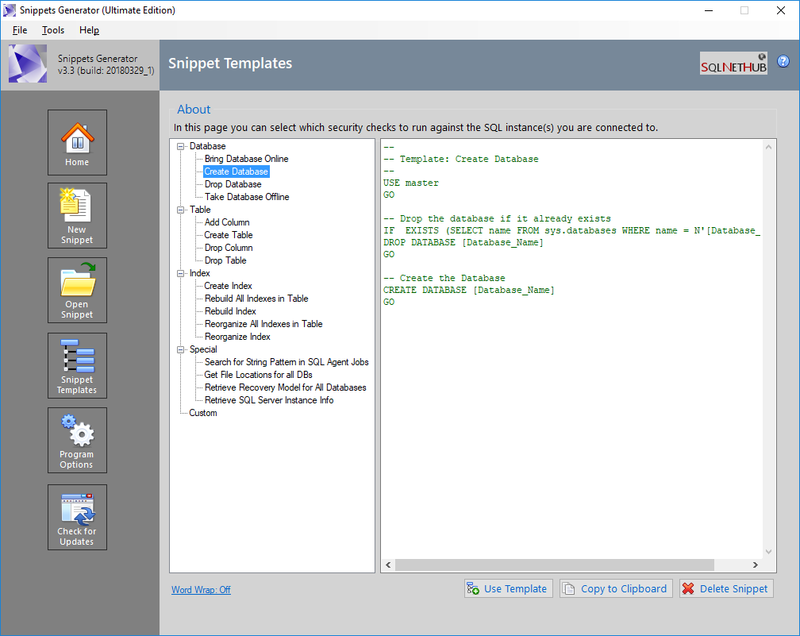 On the SQLNetHub License Activation Service website, select the software tool for which you would like to activate the license, in this case “Snippets Generator Ultimate”, then enter the serial key and activation code, and click on the “Get License File” button. If the information you entered is correct, the SQLNetHub License Activation Service will generate the license file and make it available for you in order to download it. Right after you download the license file, within Snippets Generator, click on the “Help” menu, then click on “Activate Ultimate Edition”, and finally click on the “Load License File” button. Next, select the license file generated by the SQLNetHub License Activation Service and click “Open”. If everything is OK, you will get a message that activation was successful.